Dealing with lulls on the road? Try these workout suggestions to engage your mind and body. If you’ve recently started running and your biggest issue is boredom, here are a few tips to help you keep going. To fight boredom, engage your mind as well as your body. To accomplish this, I suggest mixing up your runs as much as you can. Avoid running the same route, at the same pace, day after day. Run in different locations with varying mileage. Try diverse workouts, and do them with new running partners. Even better, find a local running group. Mixing it up helps get you out the door, keeps it fun, and boosts your fitness level. It can help to plan your runs for the week ahead. Keep in mind that every run you do should have a purpose to it. Runs can be easy for recovery, fast for speed, long run for endurance, or hill workouts to build strength. Plan your route and distance of the run with the purpose in mind. And, most important of all, keep it fun. Regardless of how hard or easy, or how long or short, the run should be fun. Experiment! Find the workouts and the running routes you enjoy the most and incorporate them, but keep searching out new options to keep it fresh, exciting, and interesting. 1. Run to a destination. For example, run to the gym or run to complete an errand – like going to the post office. You can meet up with friends so you have a ride home or plan to run back home. For a speed workout, run easy for three minutes, at a medium difficulty for two minutes, and hard for one minute. Repeat this sequence for the duration of your run. After a warmup, run hard for a short interval to a landmark like a mailbox, a driveway, or a streetlight along the route; then jog easy for recovery to the next landmark. Repeat. 4. Explore a new running area. Go to a park, or a new neighbourhood popular with runners. 5. Try a trail run. 6. Plan a hill repeat run. Find a hill in your area that is about a quarter mile in length with a nice incline. Run one kilometre for a warmup then tackle the hill. Run up the hill and jog easy down, then turn around and run up the hill again. Repeat several times. Run a one-kilometre cooldown afterward. 7. Try a track workout for speed. 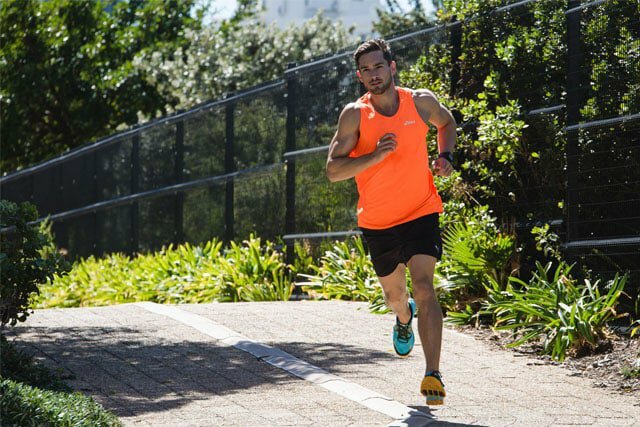 Run a one-kilometre warmup. Time yourself and run one lap at a hard pace; then, jog or walk one lap for recovery. Repeat four to six times. Set a consistent pace for the hard laps and stay within a five-second variance for each lap. Gradually increase the number of laps you run over the weeks. 8. Make running dates with friends. Nothing like good conversation to help pass the miles. Training with a group has wonderful benefits to help with running. 9. Running on a treadmill? Try using a pre-programmed hill run or interval run. The treadmill will automatically speed up or down or add an incline. Varying the pace and incline will engage your mind. 10. Register for a race. There is nothing like making a race commitment to get you out the door and focused on training. Select a local race or go for a destination race. Finding a race somewhere you have always wanted to visit is a great motivator and a fun way to tour that area. If you have already done some races, select a race that presents a different challenge – like a new distance, a trail race, or an obstacle race.